1. Reverses blood flow and improves circulation: this in itself is a huge heart-helper, because the heart spends all day long pumping blood against gravity to get blood to the body’s limbs. By getting yourself upside down, it actually takes strain off the heart. 2. Gives a great boost the the immune system: going upside-down allow lymph to move easily through the lymph nodes, picking up toxins and bacteria and cleaning out the body. The lymph system is an essential part of staying healthy and energetic. 3. Can both relax and invigorate: poses like legs up the wall and standing forward folds are very relaxing. Legs up the wall are great for insomniacs, because it’s such a relaxing pose for both the internal and external body. Handstands and forearm stands really creating energy, without getting the body overly amped up. 1. Shoulder stand: I love this relaxing asana, because it comes at the end of the ashtanga practice. That’s usually the moment when I feel all the feels: extreme peace, gratitude for what my body can do and for the investment my teacher has made in my journey, and relief that I made it to the end without dying! Real yoga isn’t “easy,” and it often feels uncomfortable as it stretches us past our physical and emotional comfort zones. 2. 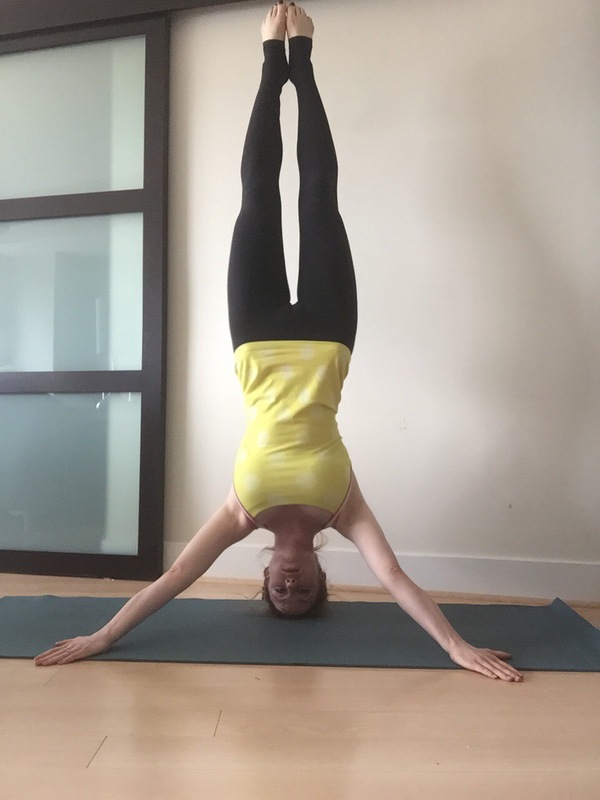 Shoulder stand with eagle legs: this adds in a little bit of a twist, and for people with short attention spans like mine, you can add this variation on your should stand to stay up a little longer. 3. 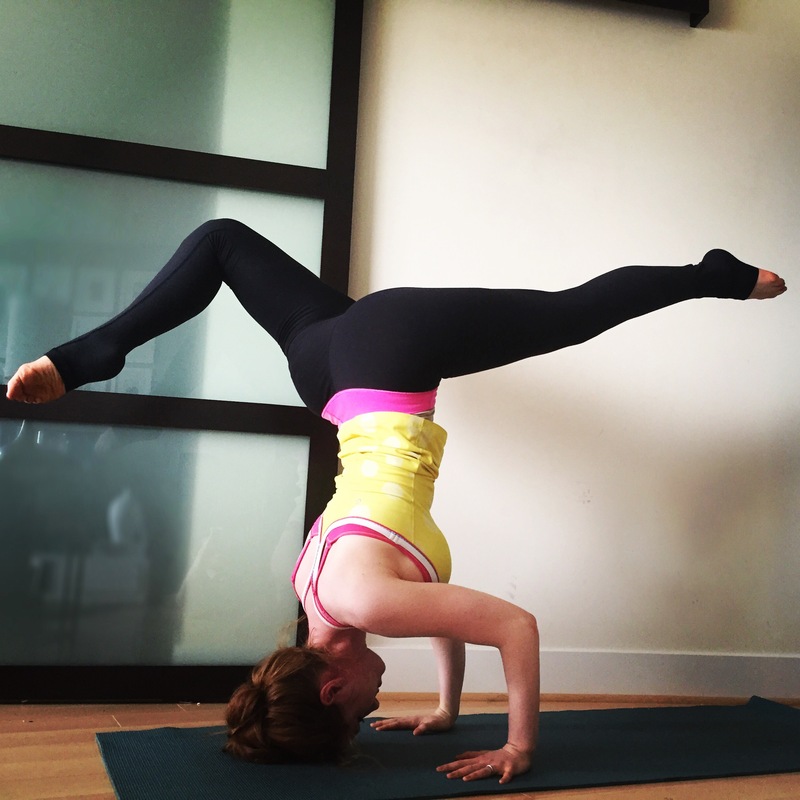 Sirsasana (Headstand): one of the traditional Ashtanga moves, you can amp your headstand by piking up and down. To pike up, walk your feet in as close as you can to really activate the core. Once you’re up in the air, to pike down and hold, shift your hips back over the head. Lower feet until you can see them, and hold to build core strength. 4. 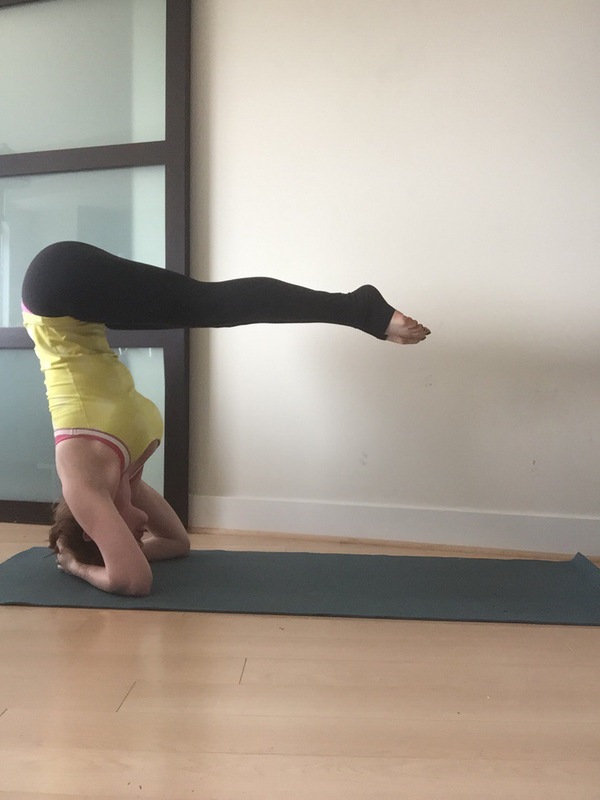 Tripod Headstand: the key to this pose is the chatarunga your arms. Keep them tucked in, and really activate your core. 4. Iron cross headstand: a more advanced version of the headstand is to enter from wide legged forward fold. Place hands flat near feet, then pike up to full handstand. This really takes a great deal of control and core strength. Be sure to keep neck engaged and apply the forth bandha (jalandhar bandh/neck lock). Lift the chest and sternum up while lengthening the back of the neck, by pulling the chin toward the back of the neck. Neck, throat and face muscles remain relaxed. This will prevent neck injuries. Regardless of where you are at with your inversions, as with all things yoga related, practice makes progress. There’s a fine but definite line between pushing your body too hard and challenging yourself to learn and grow in your practice. Listen to your body, and let your practice feed your soul. Much love! I loved this article, and I hadn’t really thought about it, but the inverted yoga exercises you mentioned carries many of the same benefits that inversion therapy does, and a few more besides! I’ve been a big fan of inversion therapy (and inverted exercises) for a number of years now, but of course, the big drawback to the way I do it is that I need an inversion table. I’ve always been curious about/interested in yoga, but after reading this, I think it might be time to do more than just think about it. Most of those exercises and positions look like something I could do, and it’d be nice to be able to take my inversion therapy with me. A little hard to lug that table around! 😉 This is exactly what I’ve been looking for – thank you! Previous PostJust How Dangerous Is Your Nail Polish?